Today was the last day of my first week here. Overall, everything is going great. Besides the heat, which wasn’t too bad this week, I actually like it here. Of the many differences from California, a few things really stand out to me. First of all, everything here is so clean and green. The roads are clean and smooth. The countryside is green and open…There isn’t even any traffic. “heavy” traffic here is like saturday morning traffic in sacramento. Another big difference here is the weather. Besides being very humid and hot, a strange thing I’ve noticed here is the complete lack of wind. There is no wind, no breeze, nothing moves the air around here very much. Another thing about the weather here is the constant thunderstorms. Like clockwork everyday the whole week I’ve been here, every day the suns goes away for a half hour or so and it pours down rain. The storm passes and it’s like it never happened………..weird. Because of the high humidity, in the late afternoon there is a “haze.” In California we have fog that reduces visibility on cold days, here they have haze that reduces visibility on hot days. Today I also had my first authentic Alabama meal. Fried catfish, hushpuppies, and sweet tea. It was all pretty good, and the sweet tea tastes just like the tea my grandma makes. That’s all for now. Sometime this weekend I’ll post a detailed description of what we are going to be working on…it’s pretty cool. 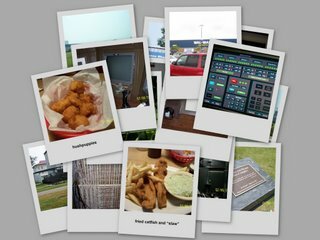 This entry was posted in main and tagged fried catfish, Greenbrier on June 2, 2006 by jotux.